It was a cool, still evening. Michael was making us dinner after having put Calvin down to bed. As Sundays go, especially rainy ones, it had been long and monotonous, having little interesting to do besides go on car rides to the grocery store and back, what with an often stubborn child prone to outbursts because of the antiepileptic drugs and their withdrawal, and being a boy who can't do things with us like walk in the woods or go to movies. To soothe my weary spirits, Michael poured me an early glass of bourbon and put on one of my favorite collections from Graph Rabbit. The songs were sweetly melancholy, something my heart actually ached for, and when I opened my laptop, this photo is what I saw. Whether it was their familiar faces looking into mine—a sight for sore eyes—or the dark clouds overhead or the low pressure or the sleep deprivation or the longing for another life, my face screwed up as tears gushed down it. 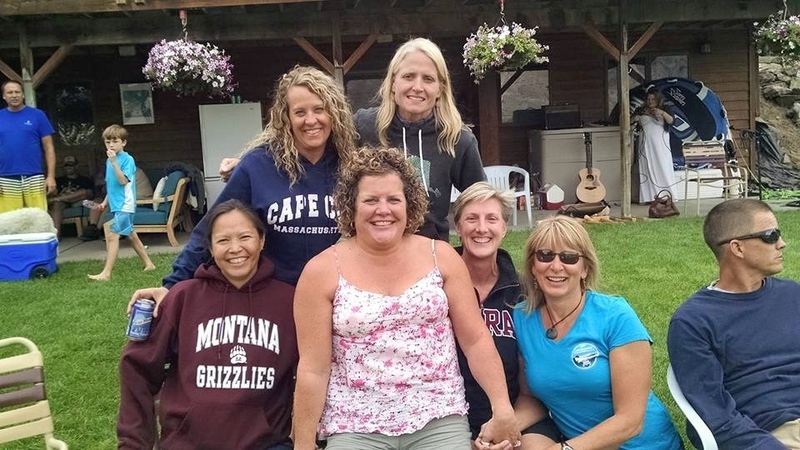 The photo was a reminder that I'd missed my college swim team reunion, which was being held that weekend at a friend's house in Entiat, a small town that hugs the bank of the Columbia River in Washington State. "I feel like I'm watching my life pass me by," I lamented in Michael's arms, expressing sorrow at not being able to go to these kinds of events and be with these lovely people because of Calvin's seizures which, during his benzodiazepine withdrawal, have become serial at times, even landing us in the hospital. It has been somewhere between twenty and thirty years since I've seen most in the group of young men and women who I spent two years swimming with at Central Washington University. Though I transferred from an NCAA division I swim team in my junior year, they took me in as one of their own and even dubbed me team captain my senior year. They never made me feel like an outsider, even though I knew the friendships they'd forged in the years before I joined them were rock solid. As I sipped my bourbon and wept, I thought of the wonderful, funny, active, smart athletes I'd seen half-naked five or six days a week at five in the morning and three in the afternoon, sometimes having trudged through sub zero temperatures in a field of snow to get to the pool. I remembered our bleary-eyed bed heads, burning lungs and muscles starved for oxygen, the stink of chlorine, the frothy water, the lithe young bodies with rippling muscles, the sets of one-hundred sit-ups, the bench press, the lat bar, the leg press, the pushups, the miles we swam each day. I chuckled to myself about having frozen hair after morning practice, recalled the swim team parties with kegs of beer and bags of chips. Most of all I remembered, even through the painful workouts, how much fun we had and the wicked senses of humor we shared under the wonderfully laid back, yet focused, leadership of Coach Bob Gregson. And now, many of these great people who I've kept track of, if only a little, were gathered together to reminisce while I drowned my sorrows lamenting my inability to be there. Instead, I'm stuck here in Maine for the time being with a chronically ill, severely disabled kid who can't go much of anywhere, tending to my garden with a vengeance—something my friend Lauren aptly refers to as horticultural therapy—hanging with my hubby on sultry summer nights in the quiet still of our backyard, so very far away from my past and living vicariously through the lives of the lovely people who helped make my life as sublime as could be—and still do, even when it is painful. Fellow members of the CWU Wildcat swim team 1985 - 1986. I'm so sorry that you couldn't be there. My heart aches for you. There's not much that makes that feeling better, but I think in acknowledging and really allowing yourself to feel, we grow in wisdom and compassion. Occasionally I read some of your posts due to someone sharing the post on facebook. You write beautifully and even though many of your posts leave me in tears, they also inspire me. Your strength and positive attitude is amazing! The post above brought an all too familiar pain wishing I could be out west sharing in the reconnecting and cherished memories. I'm not sure where in Maine you live, we spent many years raising our daughter in the Wells area. My husband and I are now in Newmarket, NH just outside of Portsmouth. Maybe sometime we could meet up and share some Seattle memories?